On my drive up to Tuolumne this afternoon, I witnessed the most spectacular Sierra Wave cloud display that I have yet beheld. Regular readers of my blog will be familiar with my addiction to clouds, and seeing a Sierra Wave is akin to a birder viewing a condor in the wild. Shad, my partner, said he had a full view of the wave across the mountain range when he drove home from Catheys Valley and I chided him for not having a camera. 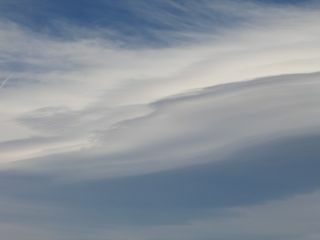 For the fascinating story behind this magnificent cloud, see my article. Twice when I have witnessed the wave, major fires were occurring in the park, and I now wonder if there is a relationship. I am working on an update of the book, Hot, Dry, Cold, Wet, and Windy: A Weather Primer for the National Parks of the Sierra Nevada with James Huning—I shall ask him about a connection. Ansel Adams' photographs have defined the Yosemite landscape for generations. Bob Kolbrener has refined that definition in his own black and white portraits of the park, paying tribute to his teacher yet achieving his own style that distinguishes the student from the teacher. Being a weather buff, Bob first attracted my attention because of his fondness for photographing clouds and storms. 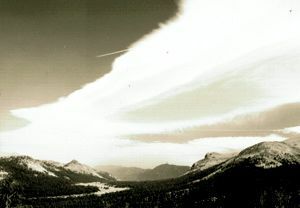 When I wrote an article for the Yosemite Journal last year on the Sierra Wave, his was gracious enough to donate the use of his photograph of the cloud, the best image I have ever seen of the phenomena, to accompany the article. The photograph is now on display, with many of his other works, at the Ansel Adams Gallery. I was fortunate enough to be able to meet Bob and his wife at a reception for his work at the Ansel Adams Gallery in Yosemite Valley. Claudia, Ed, Glenn and the rest of the Ansel Adams staff always host a great reception, from bringing in talented artists to ensuring that the curry dip and good wine never runs out. Glenn also shares willingly his vast knowledge of all things photographic. Besides being one of the nicest people I've ever met (along with his wife Sharon), Bob's photography is stunning. I'm going to employ the writer's over used defense here of saying words cannot describe his work. But truly, I'm not just being lazy. Words truly cannot capture the vibrancy of these images. A print of Bridalveil Falls appeared so lifelike that I imagined I felt droplets of spray on my face as I gazed at it. If you can't make a visit to the gallery, you can view Bob's work online at www.anseladams.com.